This week's Share with Me brings me to the Slap-N-Tickle Gallery in the Crossroads Arts District of KC. Apryl McAnerney is the owner, curator, and all around beautiful hostess of this space. 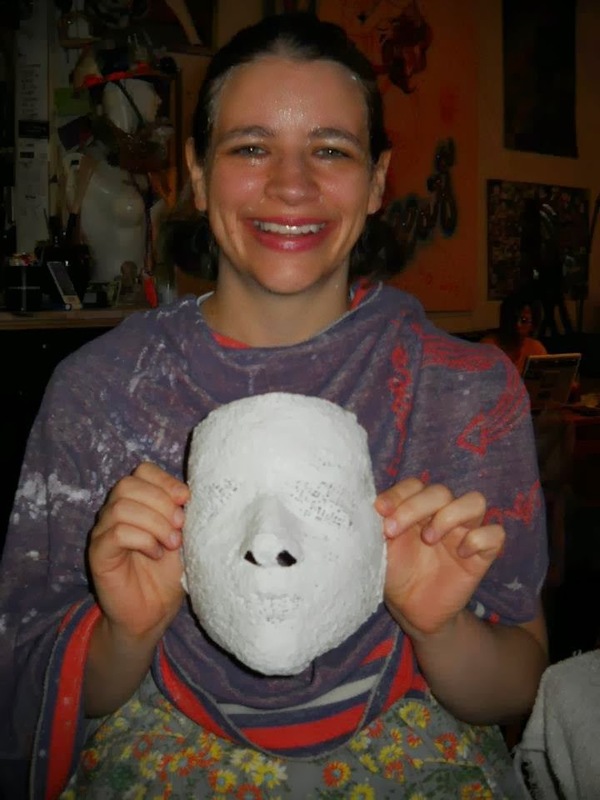 I had visited the gallery for First Fridays events, but we finally met-met while she was creating plaster masks for a personal project back in 2012 (mine was one of 100 she's working toward). I've enjoyed her smile and her hair ever since. My classy self post-mask session. Q1: Hi! What's your favorite pizza topping? Spinach, feta, garlic sauce, thin crust! Fell into my lap, after everything else fell completely apart. Then I pushed it till it worked. Seeing the look of absolute joy on an artist's face when their heart-felt creations are hung up professionally into a cohesive show on fresh walls! I am absolutely certain this is what I'm meant to do with my life right now, but I always question what other opportunities I might consider- everyone needs something to look forward to. Maybe my next goal is to move to the country and raise chickens! Yes, and Yes. If you're not getting better at something every year than you're wasting your time and your life. Although, I really love to crochet and am not getting any better at all, nor do I care.. so I guess some things are motivational and others are just relaxing, and both are important. Of course you care, or you wouldn't ask:-) I love that my existence is finally focused on finding what brings me the most joy, and understanding that having boundaries and making money is a part of that joy. Being able to pay rent just gives you more freedom to spread the bliss! When you love what you do it shows in your every endeavor and more love is attracted to you! The Slap-n-Tickle's 7th Annual Erotica Art Show- This Feb First Fridays!!! We will have our dabble session soon, so stay tuned to see what we learned from each other!